On the recommendation of the barman at Jigger’s, I made the short journey from the historich centrum ‎of Gent to J.E.F for a quick lunch before playing with the Belgian trains on my journey home to Scotland. I’d booked for lunch precisely on midday, so was the first luncher to arrive. The place immediately felt like I was going to enjoy it. 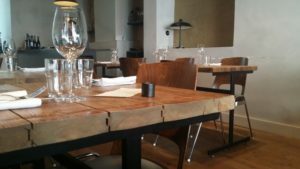 It was simple and pared back but with a sense of welcome and artisan craftsmanship that radiated through the brief set lunch menu. Options were set out much as at Norn with just ingredients listed without a clear idea of how they might come together. I hadn’t found this approach super-successful in the past but I approached things with an open mind. I ordered a couple of local beers, with the friendly and efficient waitress providing very good advice. I started with an excellent artisan pils called 13 brewed by The Ministry of Belgian Beer‎. I followed with Crabbelaer, another local Gent beer. It was a complex and aromatic Blond. To start, a little amuse bouche of pickled cucumber with herbs and herb cream arrived. It was delicious, fresh and an excellent palette livener. My mackerel soon followed looking very smart. 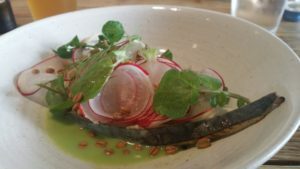 Radishes were to the fore, elegantly sliced, topping pieces of beautifully pickled mackerel with dill cream and pea s‎oup. Crunch was provided by puffed cereals. It was an outstanding dish and one of the best starters I’ve been served in all quests. The balance of flavours and textures was quite exceptional and it was a very generous portion for this style of food. The accompanying bread was, if anything, even better. Fresh from the oven, the crust was wonderfully crisp and the crumb of the bread packed with a multitude of seeds. It was quite magical. 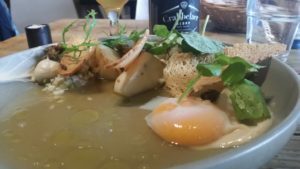 The main course arrived ‎and I wasn’t too taken with the presentation, as the main elements – celeriac three ways, fried capers and a poached farm egg – were on one side of the place and a rather innocuous looking broth on the other. What it lacked in visual appeal it more than made up for in flavour with the broth entirely outstanding. The fried capers were the ultimate in moreishness. This was accomplished cooking of the highest order. So overall, ‎J.E.F was staggeringly good. The bread and the starter in particular were stratospherically impressive. I’m very thankful to have received the recommendation and happily pass it on to you. 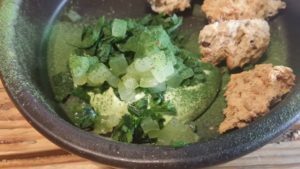 It’s a restaurant of such generous and open quality that it’s worth a special trip to Gent to try it.